... I have a very similar epilepsy throughout my life (30 years), only shorter, often very intense: 1-2 minutes, about 200 a day, very fluctuating. Diagnosed as paroxysmal dystonia - the main factor of stress. I've been using neurological drugs all my life, but if I did not try to "optimize" ... I would probably be dead because this is not medicine. I've tried everything, it's always overwhelmed by extreme stress, I can not avoid it as long as I live in a sick family but I try to take steps very active to eliminate the negative effects of my family on me ... about two years ago I tried Chinese tea (the best are pi lo chun and snow buds ), which I still order and very well makes me ginseng. What does not mean "medicine", ginseng really replaces: -) ... I want to ask what it contains, respectively. what mechanism could be used for Chinese tea, because it really can do it for 200 or more, almost continuous convulsions, "cool 50". Morning convulsion behind the cramps - a cup of tea and "comfort" ... When I told the doctors that we were going to see what it contained, so did not say anything, while we tried literally abnormal drugs - for parkisonics and so on. That's why I want you, as an expert of circumstances, to ask you if something interesting does you think? Thank you very much, Milan. coordination of movement is a challenging task for a human-sized organism because it is at the limit of the ability of our nervous hardware. With fiber lengths of more than 1m in length, tens of milliseconds are needed for signal transmission and hundreds of other motion processing programs. We do not have time to think about whether to use biceps or triceps, we just want the result of the movement and the hand is doing it "by itself". Thousands and hundreds of cerebral systems in the cerebral cortex, basal ganglia, and cerebellum are working on the movement of motion through the movement of the front spinal cord motor neuron. I would compare it to the orchestra whose command is our will. When a soloist or a general pause plays in the orchestra, all players must be silent. This is not the case for people affected by dyskinesia - the suppression of the activity of one or the other automatic system is incomplete and there are unwanted movements. Your symptom description is not detailed enough - the causes may be hundreds. It is more than clear that physicians do not have the aetiology of your convulsions or misconceptions, but they use their standard methods. The patient easily comes to GABA agonists : Diazepam, Rohypnol, Zolpidem, Valium ... They have a thousand names, but only one effect - they dampen the brain through the GABA receptors , the most brain receptors . My position on them is clear - if possible, not to take it . This is killing the fleas with a hammer. In addition, you have been given medication for Parkinson's and "abnormal medication," which will certainly be medications for schizophrenics or people with hyperactivity. Doppler Modulators? They are popular because they engage in schizophrenia and some parkinsonism . But I have a feeling that in your case the dopamine receptors will be near, but still near. You write that it makes you a good teaspoon and ginseng . An effective tea-making substance is, like coffee, caffeine . In addition, the teaspoon contains its own GABA agonist - teanin. Inhibitory GABA receptors are the most abundant brain receptor because the major interaction between brain neurons is inhibition. Thus, if we block the first neuron in the neural path, the activity of the second neuron will increase, the third will decrease again, etc. If the neural pathway forms a circle or a network, the situation is even more complicated. You ask me about the mechanism, but science can not answer. Although we know that caffeine acts on adenosine receptors and ginseng on many different receptors, we are not able to derive this information from the overall nervous effect. So, to summarize, we do not really know anything about the scientists, and you have to help yourself how you know it. The only thing I can recommend is what you already do - try your own, what helps you, and then stick to it. I'm glad your ginseng helps - and in other cases I was surprised by his potential for neurological problems. You are doing well that you are testing different species - a small change in the panaxoside ratio may have a big impact on the overall effect due to their mutual antagonism. You can also try a ginseng flower or American ginseng. As far as other options are concerned, it is difficult to advise. In my place, I would try out traditional psychoactive substances in your place. You do not know if you smoke. If not, try small medication nicotine or medicinal cannabis (preferably eat because the smoke is harmful to the lungs). Try to try and try just try if they will not take you by chance. I would also recommend to try the coca leaf decoction, which, unlike snuff cocaine, is harmless and little addictive, but if the entire plant was not forbidden in our country. I would also replace commercial GABA agonists (soothing medicines) with the Pacific kava kava ( Piper methysticum ) plant, which also suffers from unnecessary authorization problems in the EU. From what grows in Central Europe, you can try the lute, St. John's wort, the nourishing regeneration of the royal jelly, but the miracles are not. Hi, thank you for the professional answer, I do not smoke, I do not drink, I'm eating out, the main factor is stress, I know where it comes from, it's the fact that I have a shifted intimate zone, so I need my "home" I live in a "sick family". To the spasms myself: mainly tea, so I ask what can cause up to 50 or more percent drop (sometimes) convulsions after the pi-lo-chun cup, respectively. snow buds. On the contrary, when I drink more than 2 doses a day (eg 3, 4 cups, depending on watering), it causes cramps, but "classic" like a typical cramp in the calf, and then I can paradoxically get "my". As for ginseng, I have tried TaiwanTCM Liang ginseng , generally for all medicines, teas, and so on. I respond sensitively, and I know a few hours after I know what I'm trying I have half a slice of ginseng, today all, all is too much ... Ginger of a lower quality (dried root) boiled with boiling water with the addition of marigold, lengthened about 10 minutes and then again poured for about 2-3 minutes ... also doing its own. Mainly ginseng in the sense of cushioning effects of neurological drugs, even I would do according to the doctor could take 5 times the dose ... :-) but I would not write with you ... From these two doses I can say that the ginseng 6 year old is stronger, try and compare and give info. Nice day, Milan. we have found. You are endowed with extrovert, and I will be willing to answer you. Let me repeat that I am very pleased with your interest and I am also delighted that the ginseng benefits. It is a pleasure for me because today, medicine still emphasizes synthetic drugs, which are becoming more and more expensive, while ginseng doctors still doubt even its effectiveness as such. In spite of the relatively high price compared to conventional herbs, ginseng panaxosides are considerably cheaper than synthetic active ingredients - when you take a well-dried red ginseng root , up to 20% of its weight is pure active ingredients. As far as your other questions are concerned, they basically coincide with those you put in my first letter. You will find answers to them in my first answer, but I can give them more shovels. I do not know if we have a good understanding of smoking. My suggestion was just to try nicotine as a medicine, not necessarily by inhalation of smoke. Nicotine is, in most cases, harmful, but it helps in some cases. These include some neurological problems related to dopamine pathways. Nicotine I mention purely because most doctors will not remember him as a drug. Oral, transcutaneous or safe inhalation can be given by the so-called electric cigarette - the noxious nicotine inhaler. I have responded to problems with your family in silence - the need for moving is clear, financial problems are now the norm in Central Europe. This problem has no easy solution. I did not want to discuss your life. When Captain Scott returned from the southern pole 100 years ago, his polar night and snow storm with temperatures of -40 ° C were caught. Inventory went out, and their legs were frozen. They considered suicide, but they agreed to perish naturally on the march. But they did something else - they camped, climbed into their sleeping bags and gradually made their way. Scott was the only one after a week's wait for better weather to try to get up - found him frozen in a sleeping bag. Mr. Milano, if you can not do anything, open the sleeping bag. Or adapt as Smoljak and Svěrák sing. I also silenced the neurophysiological nature of the action of the tea plant on your dyskinesia, because I was ashamed to crawl the hypothesis about what not to explain even the specialists yet. But to prove that I'm bluffing, I draw a picture of dopamine path involvement from a recent speculative publication ( Lisman2008cfu , pictured right) and derived from my own speculative suggestion of teaspoon caffeine and teanine on this path (picture below). 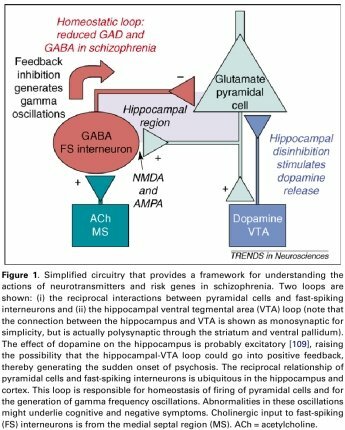 For example, you may notice that my caffeine pattern acts actively on P2X receptors of inhibitory interneurons (and potentially the entire chain of inhibitory interneurons), as well as on pyramidal cells themselves, which represent the data output of the cerebral cortex. It can be imagined that low-dose tea-based caffeine activates not only the pyramidal cell, but also inhibitory interneuron, which, however, suppresses its increased activity by the pyramidal cell so that it is even less active than if there were no caffeine in the brain, so your spasms . At high caffeine concentrations, however, the activation of the pyramidal cell is so strong that even the increased buffering effect of interneurons does not inhibit it and the cramps become stronger. But this is only one of the dozens of possible explanations. Similarly, teanine can be considered, which in turn increases the level of inhibitory neurotransmitter GABA. Whether you are the active ingredient of caffeine or teanin you can find out by trying coffee. If coffee does not handle, but tea does, tea-specific substances are key to you. Then it would be understandable that you are seeing the differences between tea (teas). Especially the so-called white tea you praise should have a higher ratio of teanine to caffeine. The highest amount of teanin has Japanese tea gyokuro. On the Lisman article diagram (top right) you can still see the letters "ACh" on the square blue-green color neuron. They mean acetylcholine and just the central acetylcholine receptors act on the nicotine I talked about earlier. I hope my mechanistic speculation was not entirely incomprehensible. I knew a neurophysiologist who suffered from dyskinesia like yours. He was a very intelligent person who had obviously Pasteur's motivation to study, and with respect to writing this more detailed answer.